The ROKU System EC Endless Collar consists of one or more layers of high performance intumescent material ROKU strip or ROKU strip EM wrapped in a stainless steel strap fixed in place with fastening hooks to walls or ceilings. In the event of fire, the intumescent material expands sealing the opening hermetically against flames and smoke. For wall installation one pipe collar each side of the wall must be provided and for ceilings one on the underside of the ceiling is required. 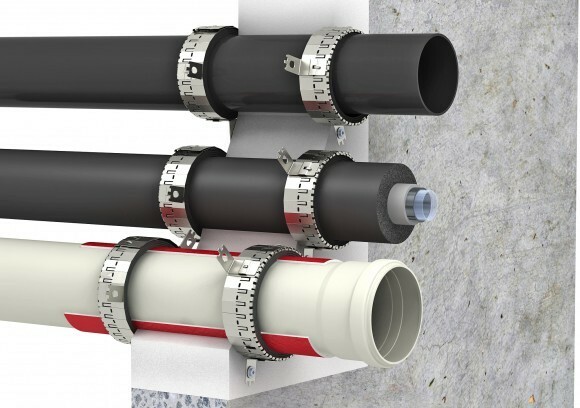 Sealing of plastic pipes up to a maximum of 160mm in solid walls, drywall partitions and solid ceilings. Suitable for plastic pipes, mineral fibre reinforced plastics and plastic composite pipes, PE acoustic insulation covered plastic pipes. Synthetic rubber insulation on plastic, copper and metal pipes. Can seal up to 3 pipes in one wrap. Easy fix gives excellent usability. Technical data including ETA available on request. Practical dispensing box for easy usage.